Hello there! I am a new member, I am a achievements hunter always looking for good methods to track my achievements. I was wondering, when was this site and how many things I lost? 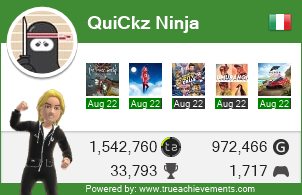 So what's different about trueachievement? I'm a gamer. Xbox & Windows Gaming Platform. Welcome to GTN!!! This is an awesome community! Make yourself at home! Join the leaderboard that is *actually* #1 on the site! All friends of mine are welcome and anyone who prefers poptarts over fish! Join My Leaderboard, Up Vote my Reviews and Solutions by Clicking Below!